After playing this for about a month solid, I feel it's fair to say it might be my favorite old school Toaplan-style shmup. There's so much it does right - game play and pacing, soundtrack, sound effects, simple scoring - and so very little it does wrong! It can be hard and getting sniped in the later stages is brutal, but when you get in the zone, it's super satisfying in a way very few Shmups can be. I picked up the pcb after deciding to let go of Ghosts and Goblins, because even the thought of trying to get the 1 loop clear is unappealing, two years after I stopped playing it. 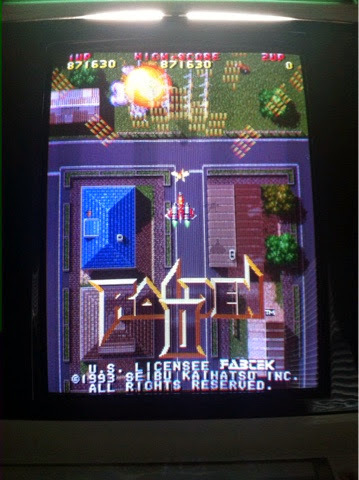 Raiden II is just so enjoyable, so fulfilling when you get it right, that i just don't want to take it out of the cab for any reason. I'm shooting for the 1cc and my skills with old school games is such that I can see it happening, but really, only time will tell. High score right now is a paltry 871,630, but progress is coming swiftly. Ah yes, now you are taking a step in the right direction! You know I am a huge Seibu Kaihatsu fan boy, so this news gets me excited. I know the Raiden Fighters series is a little more "modern" than you prefer but I really think they are games to look into after you 1CC this game. They are very methodical in your quest of the medal chaining, and triggering all of the secret bonus point events is very satisfying and rewarding. I really think you should give them a chance.